If you asked the average golfer their top bucket list golf destination, three places would surely come to mind. One is Augusta National, and an additional wish to either become a Fortune 500 CEO or befriend one for any hope in playing there. Another is St. Andrews in Scotland, where depending on the time of year you could fit 54 holes around that track into a single day. The third would be Pebble Beach, California, which serves host for the 2018 AT&T Pebble Beach Pro-Am. Pebble Beach is truly a golfers paradise as it is home to eight world renowned courses that are annually ranked highly in the Golf Digest Top 100 Courses in America. All the courses in the area are premier destinations and would highlight anyone’s golf trip (assuming you have $500/round laying around to burn). But the three that will be used for the tournament are Spyglass Hill, Monterey Peninsula, and the famed Pebble Beach which has played host to five U.S. Opens and will serve host again in 2019. The origins of the tournament started way back in 1937 when avid golfer/crooner Bing Crosby unofficially created the first ever Golf Buddy Getaway, as he put up $10,000 of his own money to host a golf tournament at Pebble Beach for all his Hollywood pals. They would team up with a golf professional to vie for a whopping $500 winning prize, followed by a giant clam bake at the end of the tournament. This event gained so much popularity that it became an official PGA Tour event in 1947 and continues to attract not only some of the best golfers on the planet, but also notable celebrities like Wayne Gretzky, Bill Murray, Aaron Rodgers, Larry Fitzgerald and editor of SportsGamblingPodcast.com Christian Pina’s mancrush Tony Romo, just to name a few. From the viewers perspective, though, the presence of the amateurs in the field can be a bit burdensome. CBS has notoriously been the poster child for how not to televise a golf tournament, often focusing too much on building a story instead of showing, you know, actual golf. And that criticism should come to a head this weekend with five hour rounds and Jim Nantz interrupting the telecast to conduct bland celebrity post-round interviews that no golf fan really cares about. Sure, if Jim Nantz had a sense of humor he could ask Alex Smith what was more demoralizing – duck hooking his tee shot into the ocean or getting dumped for Patrick Mahomes in Kansas City. But between Nantz fake chortling to Larry the Cable Guy’s jokes, Alfonso Ribiero teaching Nick Faldo the “Carlton” and replays of Chris Berman swinging like he’s in a Beer League Softball Tournament, Twitter should be aflame with scathing messages towards the production team to #ShowThePros. None of the three courses are overly long, as all three play at around 6,900 yards each with Pebble Beach and Spyglass playing as Par 72’s, and Monterey Peninsula playing at Par 71. 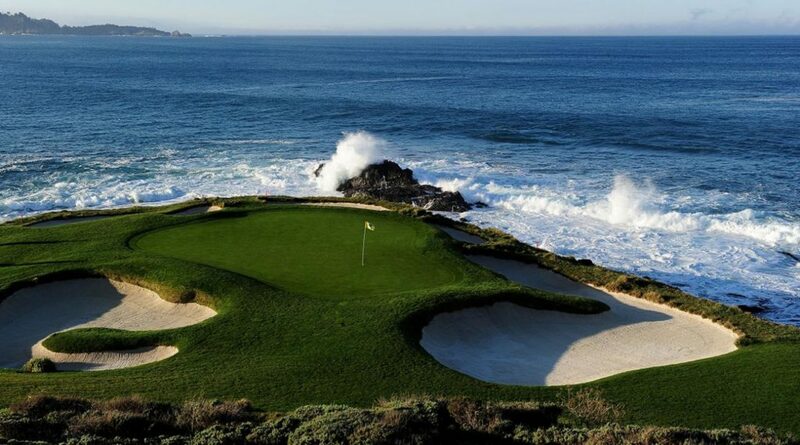 But bombers won’t be able to overpower all of them thanks to small greens, rocky cliffs, and numerous bunkers protecting the golf course (Pebble Beach alone has 117 bunkers eagerly awaiting to gobble up errant shots). Still, with pristine weather conditions expected on the Pacific Coast this weekend, birdies should be there for the taking with the winning number approaching 20 under. Therefore, as you look to fill out your DraftKings Lineup and betting tickets, target golfers who rank highly in Strokes Gained Tee to Green and are able to putt well on the Poa Annua greens to go low on the scorecard. It goes to show how dominant Dustin Johnson has been playing that his odds of winning the tournament are 11/2 in a field that features the likes of Rahm, McIlroy, Day, Spieth, Mickelson and others. But it’s not only his stellar play of late that makes him the overwhelming favorite, but he’s been exceptional at Pebble Beach in his career. He won back to back in 2009 and 2010, and if it wasn’t for a redacted cocaine joke historic Sunday collapse he would have taken the 2010 U.S. Open there too. While putting isn’t necessarily his strong suit, he does historically putt well on Poa Annua surfaces and his strokes gained putting stats have been halfway decent over the last year. The price tag on his win odds and DraftKings Salary is steep, but no one should be surprised if he takes home the title on Sunday. Rory McIlroy makes his first start on the PGA Tour this year after a very disappointing 2017. Rory switched over to Taylor Made in 2017, and similar to his switch from Titleist to Nike in 2013 the transition wasn’t necessarily the smoothest. He also suffered a rib injury in the course of testing new equipment and was never quite right all season long. After an extended time off, Rory appears healthy and ready to reclaim the #1 World Ranking after coming off two impressive performances in Dubai on the European Tour. While I have no doubt in Rory’s tee to green game and I expect him to win a major in 2018, I want to see how Rory is with the flat stick before I start trusting him in my lineups or laying down serious capital on him. Watch how he putts this week, and if he’s showing signs of life we could be on the verge of another one of his vintage hot streaks like what we saw from him in 2014 and 2016. On the surface, a $10,700 pricetag on defending champion Jordan Spieth seems like a bargain, but I’m running away here. Once considered automatic from inside 10 feet, Spieth looks completely lost from that distance and it’s starting to show on the scorecard. Spieth had several scoring opportunities at the Waste Management Phoenix Open but couldn’t convert on his way to losing 2 strokes/round on the greens and his first missed cut since last May. It irritates me when the analysts are shocked by his inability to make short putts, as it seems like he’s been struggling from that range ever since missing his short par putt on the 11th at the 2016 Masters (the hole before the infamous quadruple bogey at Amen Corner). Currently sitting 195th(!!!!!) in Strokes Gained Putting, I just can’t count on him as an anchor for my DraftKings lineup until he starts turning that around. Phil Mickelson will probably be a chalky play on DraftKings this weekend after his strong performance in Phoenix, but he looks primed to get back in the winners circle. It’s hard to believe that Tiger Woods has won more recently than Phil has, but between his great success at Pebble Beach, his improved tee to green game and hot putter he should be a contender throughout the weekend. While the $9,600 price is a little higher than what I want in a DraftKings lineup, I’ll be laying down some capital at 28/1 for him to win for the first time since 2013. Pat Perez might need a new passport from all the stamps he collected through customs the last few months. Perez played the fall Asian swing in October (including a win at the C.J. Cup), flew over to Mexico to play in the OHL Mayakoba, hopped over to Hawaii for the Tournament of Champions, took a quick stop in Malaysia for the Singapore Open before wrapping up his World Tour in the Omega Dubai Desert Classic. Despite the hectic schedule he has played solid golf and has typically putted well on Poa Annua surfaces. Perez should be a nice play for your DraftKings Lineup and at +300 for a Top 10 finish. Patrick Reed hasn’t really been in the mix for a win of late, and maybe that’s why his DraftKings salary is surprisingly low at $7,900 this week. But his ball striking has been solid and his putter has been fairly good over the last few tournaments. Reed also excels on putting on Poa Annua surfaces and, like Mickelson, could end a winless streak that dates back to September 2016. Kevin Kisner hasn’t quite been able to carry forward some momentum since finishing T7 at the 2017 PGA Championship and 3rd at the 2017 Tour Championship, putting together a string of meh performances so far in 2018. He’s been slumping off the tee and with his irons of late, which is uncharacteristic of his game for the last two years. But he’s still one of the best putters on tour and a lot of his ballstriking stats are supressed thanks to his disastrous final round 76 at the CareerBuilder Challenge where he fell to a 50th place finish. I expect him to hang around the Top 20 when it’s all said and done and be quite useful for your DraftKings lineup this weekend. There’s a few headscratching DraftKings values this weekend, but none more than Austin Cook’s at a paltry $7,000. Cook was set at $8,300 last week, and though that was overvalued his performance in Phoenix didn’t warrant a $1,300 drop behind the likes of Johnson Wagner, Colt Knost or Brendon de Jonge. His Strokes Gained Tee to Green and Putting stats look very solid, and while he might be a chalky DraftKings play I like his +275 Top 20 odds and in tournament matchup props this weekend. If you want a chance to load up on two studs at the top, you’ll need to go dumpster diving at the tail end of your lineup. Everyone’s hot sleeper last week was Brandon Harkins after a strong performance at Torrey Pines and PGA West. But his approach shots were subpar in Phoenix and he delivered a dud for his 11% ownership in DraftKings. I’m going to zig towards him as everyone else zags and expect him to put up a better performance on the back of a positive regression to better ballstriking and a hot putter. Hey, did you know that Sam Saunders is Arnold Palmer’s grandson? What do you mean I’m the 568,209th person to tell you this? Anyways, besides being able to brag about that all through prep school it turns out he’s a pretty good golfer himself. He’s undervalued on DraftKings and boasts solid Strokes Gained Tee to Green and Par 5 Birdie or Better stats during his short PGA Tour career. He’s a good candidate at longshot Top 20 odds this weekend. Seamus Power is another example of a headscratching DraftKings value but for the opposite reason as Austin Cook. Admittedly, his $7,600 price tag is way too high given his stated odds and his 2018 performance, as he’s only made half the cuts in tournaments he’s entered into. 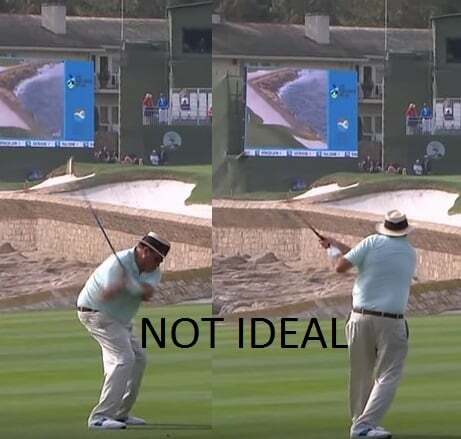 Yet if you’re looking for golfers who are proficient tee to green, a solid putter and can get up in down from one of the many bunkers guarding the three courses in the rotation, you could do a lot worse than Power here. He’ll probably get overlooked at that price over other known commodities around him like Charley Hoffman, Shane Lowry and Bubba Watson, so I’m willing to pay that price for a contrarian play in my lineup, as well as take an 8/1 flyer on a Top 20 ticket on him this weekend.